Earlier this week the NACC Team turned off our computers, packed our overnight bags and conveyed to the Turquoise Coast to talk strategy and values. NACC has held an annual team retreat for the past four years, and this year the Board also participated as they knuckled down for a full day to talk strategy, directions and business planning. I can’t wait to share with everyone some of the exciting initiatives we will be investing our capability in, to deliver NRM in the NAR. Make sure you keep a keen eye on our social media channels and NACC Notes, to stay up to date. Better yet, sign up as a NACC volunteer using the contact form on our website and you’ll be the first to hear about opportunities to participate in these exciting initiatives. After the planning workshop the Board was joined by the rest of the NACC team. Making the most of the sunshine, the staff retreat officially began in Green Head with a catch up with local Coastcare champions – Green Head Coastcare Group. Before heading off to discover the acclaimed 3 Bays Walkway, the Green Head Coastcare Group spoke about their 20 year journey and highlighted some of their successful and not so successful projects. One of their many stand out projects was the extent of brushing on the dunes to prevent erosion and encourage natural recruitment. 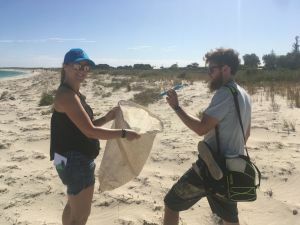 Some of the NACC team were involved in a dune brushing exercise with the Coastcare Group three years ago – and they were all were pleasantly surprised by how much the dune environment has improved in such a short time. 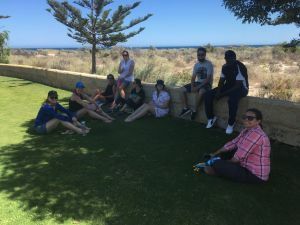 After enjoying the many views of the 3 Bays Walkway – which if you ever pass by Green Head I strongly recommend you visit – and a quick photo shoot with Dynamite Bay as a backdrop, the board departed homeward and the team work began. A short drive south to Jurien Bay and a much needed coffee stop were next on the agenda, along with a team meeting to recount the past year and discuss future directions. 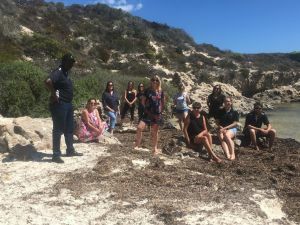 For me the highlight of this year’s retreat was the beach clean-up at Jurien Bay. We can certainly give the NACC tick of approval to the residents and visitors of Jurien Bay who are doing a fabulous job of keeping their town beach spotless. Although we can’t say there was nothing to pick up, the rubbish was definitely slim pickings. While scouting the beach for rubbish, the NACC team were also taking photos to represent our values – Passion, Collaboration, Professionalism, Leadership, Respect, Accountability, Excellence and Impartiality. Over the next few weeks the team will be creating a series of slideshows with these photos and I can’t wait to share some of the amazing pictures of this activity with you very soon. Lastly, one of the most valued elements of our team retreat, is the community activity. If you have an idea for an activity for our next team retreat (2020) we would love to hear from you! We love contributing to regional communities all year round, but getting to do this as one big team every year, is a special highlight for everyone. Once again, the crew has been reinvigorated and I’m once again very proud to call this fantastic group of people my team. Congratulations NACC team building & reinvigorating ourselves is very important.